Official website of the Prime Minister of Poland has been developed by Direktpoint. We were responsible for its desktop and mobile development, maintenance and ongoing side projects. The website includes dedicated security solutions, also developed by us. The website meets very strict WCAG 2.0 (Web Content Accessibility Guidelines) requirements – has received numerous industry recognitions. It is to our great satisfaction to inform that the official website of the Prime Minister of Poland has been launched. Direktpoint was responsible for its development. Creation of the new website is based on changing the way how it is perceived and moving away from the ordinary form of administration website full of regulations and unclear information. The objective of the Government Information Center was to build their own communication channel. In order to achieve it, the new website should include such forms as video, photo galleries and infographics. Data concerning the government appears on the website without delay - often before other media - which makes it the leader of news disposal in its own category. 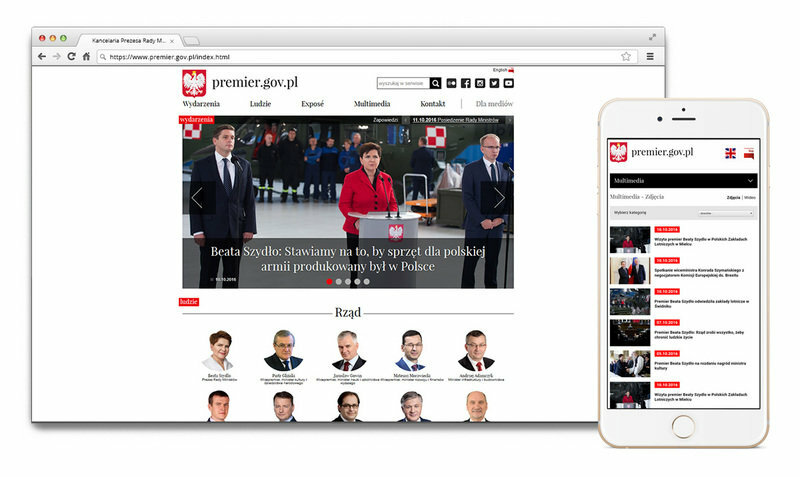 Main page of the polish Prime Minister portal and responsive mobile version of the site. We also launched a mobile version of the website where users can find complete package of all news normally achievable on the regular full site. We made an app which automatically identifies users device and set up a appropriate variant of the service adapted to particular mobile browser. Together with the „Integracja” Foundation we have implemented one of the most advanced solutions for handicapped users. Despite its modern form and many technological solutions they can explore the specially designed contents, including the use of applications or devices dedicated to visually impaired users and where navigation does not require the use of the computer mouse. Website meets very strict WCAG 2.0 (Web Content Accessibility Guidelines) requirements. At the design stage, the challenge was to create the most adequate information architecture as well as the migration of data, i.e. adaptation of existing data to the new structure. We have come up with a simple and a very clear navigation system thanks to which one can easily find information regarding new projects, social consultations or plans of the Ministry. The website features an extensive but intuitive network of internal connections. We tried to gain in-depth knowledge regarding objectives of the organization so that we could present them to the citizens as clearly as possible. Modern graphic design of the website has been provided by Netizens company. Salestracko - Direktpoint first startup!